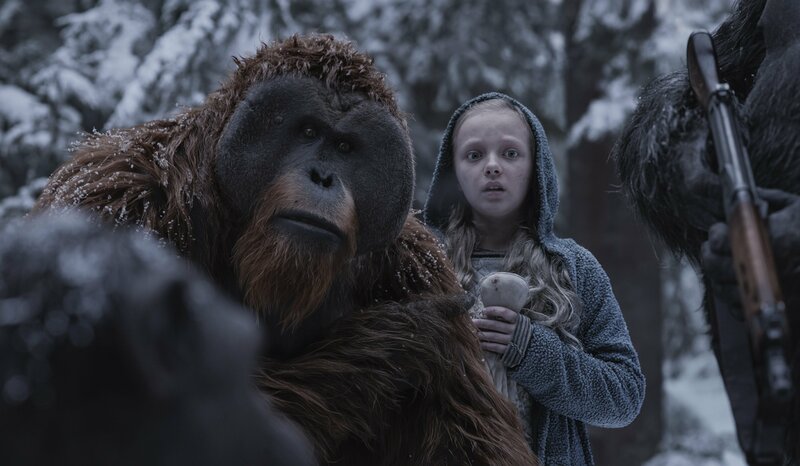 The third film in the Planet of the Apes reboot/prequel, War for the Planet of the Apes, is a fitting conclusion to this unexpectedly great film trilogy. 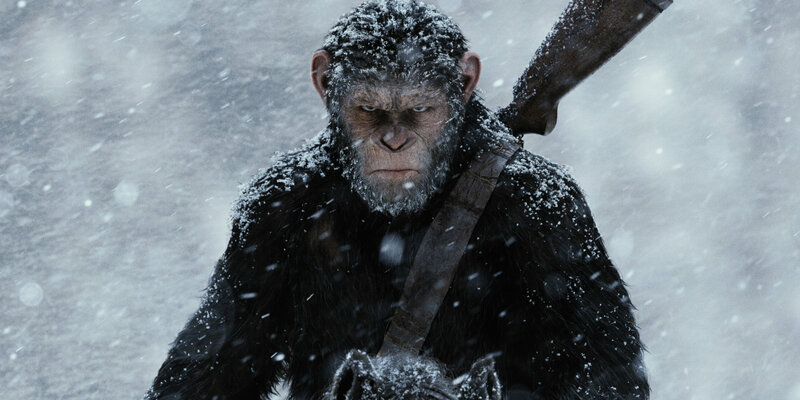 The film series follows the emotional journey of Caesar (motion captured by Andy Serkis), the super intelligent chimpanzee capable of speech who fights to defend his kind, while while he grapples with intense moral questions. In this film, Caesar is an embittered and weary leader who finds himself fighting a very different kind of war. Taking place 15 years after the first film, Rise of the Planet of the Apes, this film opens with Caesar and his band of super smart apes besieged by human military forces in the thick forests of the west coast U.S. During the trilogy a deadly virus wiped out most of humanity and apes rapidly evolved to have human-level intelligence. Both humanity and apes are in dire straits. Caesar only wants his kind to be left alone, while the desperate humans see the apes as a threat to their dominion of the Earth. Tragic events lead to Caesar undergoing a dark metamorphosis where he has come to hate humanity as vengeance rules his heart. He sets out on his own to hunt down the human responsible for his misery, a crazed soldier known as the Colonel (Woody Harrelson) that leads a rogue military unit. However, his closest compatriots, which include the gentle and wise Maurice (motion captured by Karin Konoval), an orangutan, refuse to leave his side. During their journey, they come across two new and interesting characters, Nova (Amiah Miller), a young mute human girl, and Bad Ape (Steve Zahn in a motion capture performance), a nearly hairless and humorous chimpanzee who is also able to talk. Both characters in their ways represent the downfall and promise of both species. While both Nova and Bad Ape’s arcs were fascinating to watch, Caesar’s emotional turmoil is the heart of this film and that is where the real war rages. Without giving too much away, the film’s title is misleading. 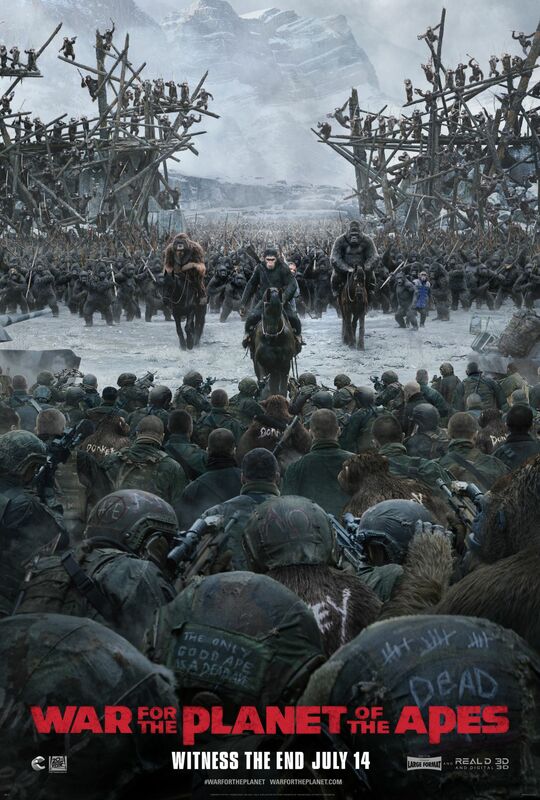 War for the Planet of the Apes isn’t an action-packed military film with epic battle scenes boasting large armies. There are some well choreographed battle scenes, but this film is more of a meditative drama that makes viewers think about the moral complexities facing Caesar. It is disheartening to see Caesar’s arc from the wide eyed and innocent ape in the first film to an angry and dark soldier in this film. He is not some bloodthirsty savage and deep inside he is a good being. It is just that sad circumstances have challenged Caesar and he questions how he has changed for the worse. That is the true war in this film, where his soul is the battlefield and prize and it is not clear how this inner battle will conclude. This spiritual conflict define Caesar and makes him seem so…human and is the true highlight of War for the Planet of the Apes. Of course, the film has so much more going for it than Caesar’s soul searching. The other characters are just as engaging as the lead ape. The Colonel is a truly frightening beast of a man who wants to ensure the survival of his species. What is disturbing to us is that we can relate to his point of view and wonder if we would be as desperate as him if we faced the same dilemma. Unlike the past films, there is less emphasis on the humans as the apes dominate the film. So as a result the human characters are not as nuanced as in past films. There are some other drawbacks to this film; mainly that the plot features some biblical allegories that are a bit heavy handed and telegraph how some stories will play out. But the film’s merits make up for the flaws. The film boasts the best special effects of all the Apes films. By now, the CGI apes look flawless. There were many instances where it is easy to believe that real apes were used. The motion capture and the special effects are completely convincing. The film is beautifully shot with rich colors and perfect composition as we witness a richly textured post-apocalyptic world that is being reclaimed by nature and the apes. However, these merits would not mean anything without the brilliant performances of Serkis and the others. It is a crime that Andy Serkis has not won an Academy Award for his work and he certainly deserves one for this film as it’s his best work. The Academy just has to get over its hang up about motion capture and recognize its powerful artistry, which is this film exudes. So, how does War for the Planet of the Apes compare with the other films in the trilogy? It is hard to say at this point, but this film holds its own compared to the earlier films, although Dawn of the Planet of the Apes is the best one in the series. 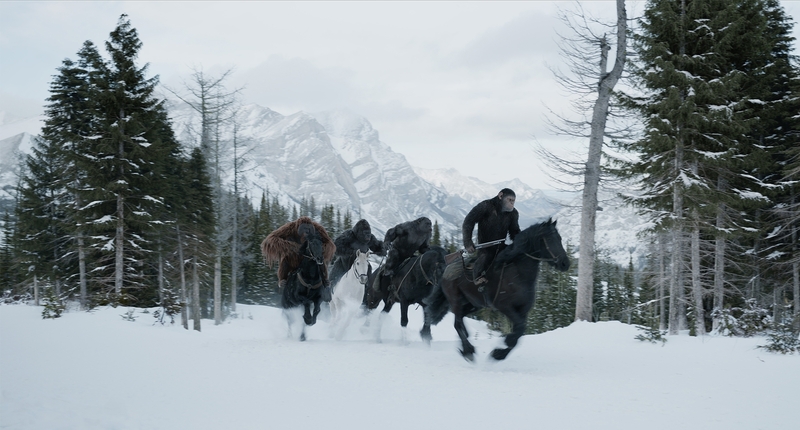 Nevertheless, War for the Planet of the Apes is a powerful and thoughtful finale to this trilogy that should not be missed. Great review, War certainly holds up well alongside Dawn I would say. Serkis was superb as always and Bad Ape was a pleasant and joyous surprise. I wish more franchise blockbusters were executed with such intelligence and soul. Indeed, the new Apes trilogy is one of the few that had terrific entries throughout. Even the old films were for the most part well executed for their time. 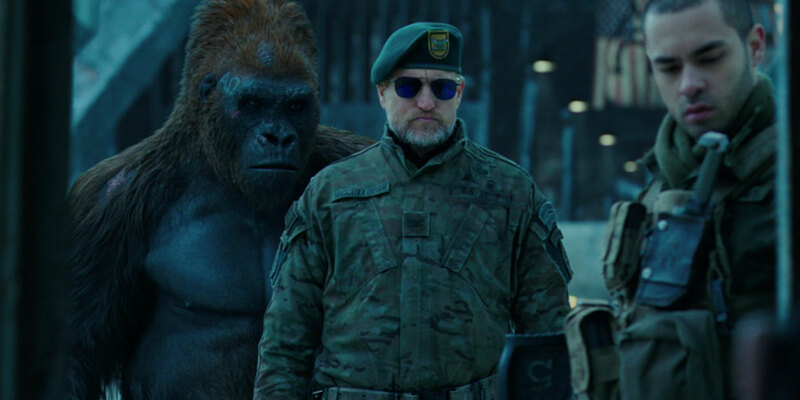 Overall, the Apes films are vastly underrated and drowned out by all the blockbusters out there, but the films have consistently delivered smart and captivating sci-fi.